In the early Sixties, Los Angeles Dodgers outfielder Wally Moon started a baseball summer camp at the Baptist Seminary in the Covina Hills, only about a mile from our house. Since we were a big "baseball family," it was natural that I attend. That mitt's bigger than my whole chest! 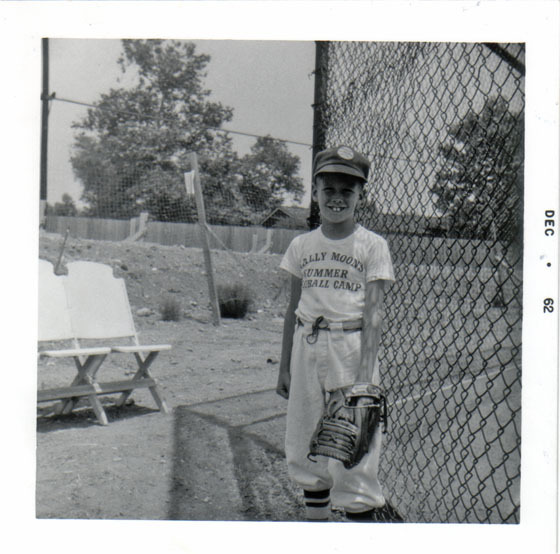 Recently, I had some old home movies converted into DVDs, and was delighted to discover footage of me playing my first game at Wally Moon's in the summer of '62, when I was 7 going on 8. I have a ton of fond memories about the camp, but it was great to actually see the place again. It reminded me of just how much fun I really had there.